Grace has Cerebral Palsy. She was unable to roll over or crawl until she was 4 years old, couldn’t stand, and was told she would never walk. 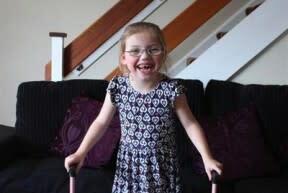 In January 2012, Grace flew to the USA to have a special operation called Selective Dorsal Rhizotomy (SDR) to remove the spasticity (tightness) in her legs, and a second operation 3 weeks later to lengthen her leg muscles. In the two years that have followed she has completed 9 intensive three-week physiotherapy courses, along with daily physiotherapy at home. Her hard work has been paying off, and in April 2014 she took two unaided steps for the first time in her life! To allow Grace to continue to progress, we need to raise £15,000 to £20,000 per year for Tree of Hope to pay for her ongoing physiotherapy and other medical aids (shoe splints, specialist prism glasses, walking aids and so on). Grace also needs funds to support her final trip to St. Louis Children’s Hospital (USA – where Grace had her operation). With your help, and the support of Tree of Hope we hope to raise £50,000 to cover these costs from now through to 2016.